The Players: A non-Arab minority comprising 25 percent of the Iraqi population, who have enjoyed de facto autonomy under U.S. protection in northern Iraq since the Gulf War in 1991. The most politically cohesive of Iraq's ethnic communities, they are led by Jalal Talabani and Massoud Barzani, two leaders who have settled their factional differences in order to present a united front in pursuit of enhanced autonomy in the new Iraq. And between them, Talabani and Barzani command 70,000 "peshmerga" militia fighters. The Script: They backed the U.S. invasion on the promise of keeping, or extending their autonomy from Baghdad. In particular, they hope to extend Kurdish control to the city of Kirkuk, and reverse the effects of Saddam's expulsion of Kurds and settlement of Arabs in the city. And they want control over substantial oil revenues generated in their bailiwick. Those demands are rejected not only by the Arab and Turkomen minorities living in Kirkuk and Mosul, but also by the Shi'ite religious leadership which opposes minority vetoes and the dismembering of Iraq. The interim constitution brokered by the U.S. allows them to maintain their de facto autonomy and grants them a veto over any future Iraqi constitution not to their liking, but Shi'ite leader Grand Ayatollah Ali Sistani has warned that the interim constitution will be abandoned as soon as Iraq has elected a representative assembly. Already angered by their limited representation in the new government, Kurdish leaders sounded the alarm when Sistani persuaded the UN to avoid endorsing the interim constitution in its recent resolution backing the transfer of authority on June 30. In response Talabani and Barzani warned the U.S. that unless the interim constitution is upheld, the Kurds will boycott the January election and effectively walk away from the new Iraq. Easier said than done, of course  preventing a Kurdish breakaway is a priority that unites such traditional rivals as Turkey, Syria and Iran, each of them fearing for the consequences among their own Kurdish minorities. The Turks may be tempted to take military measures to prevent it. The Challenge: As the U.S. moves to reduce its exposure in Iraq, the Kurdish leadership face an uncomfortable balancing act between their desire to live independent of Arab authority and the need to avoid provoking a showdown that risks seeing them crushed by the combined pressures of Iraq's neighbors and its Arab majority. The Players: Shi'ite Arabs comprise almost two thirds of Iraq's population, and their community has produced a wide spectrum of political parties, from some of the secular figures in the interim government to the radical Islamist followers of Moqtada Sadr. 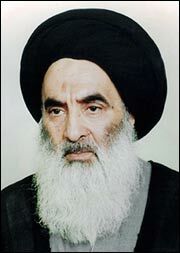 The single most influential figure among them is the supreme spiritual leader Grand Ayatollah Ali Sistani. His closest supporters in the political realm are the Supreme Council for the Islamic Revolution in Iraq and the Dawa Party, both of which are represented in the Interim Government. The Script: Although Sistani has avoided appearing in public or pronouncing directly on constitutional matters, he is believed to favor democratic government rather than Iran-style clerical rule in matters of national politics. But democratic majority rule  and therefore, a dominant role for the preferences of the Shi'ite majority  remains non-negotiable for Sistani, who while counseling patience and avoiding confrontation with the Coalition has nonetheless insisted that only an elected Iraqi body can decide the country's future. He won a showdown with the U.S. over the question of elections, which are now scheduled for January. But he's concerned that the U.S.-brokered constitution dilutes the power of the Shi'ite majority by granting veto power to minorities, and has vowed to tear up that constitution after the elections. The Challenge: The Shi'ite mainstream will be doing its utmost to see that elections actually take place in January, finally giving the Shi'ites an influence commensurate with their numbers over Iraq's destiny. They're likely to resist any effort to postpone a poll, particularly because Sistani and the parties close to him are under pressure among ordinary Shi'ites as a result of the challenge of the more radical element led by Moqtada Sadr. If elections are held on schedule, he'll feel his caution was vindicated. If there's a delay, Sistani will be caught between pressure to act and a fear that the path of confrontation could bring protracted chaos and result in the breakup of Iraq.